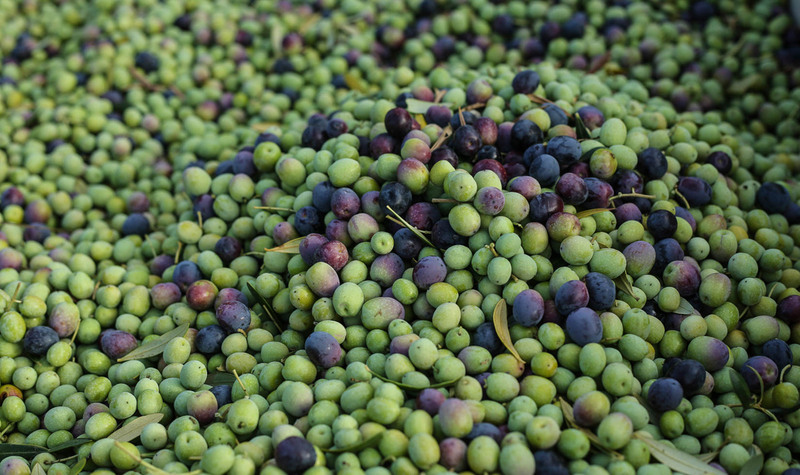 Moderate weather during summer and fall afforded us the opportunity to wait until November to begin the California olive oil harvest when each variety of olive reached ideal ripeness. The resulting pure olive oil, always extra virgin, has attractive aromas of fresh-cut grass, green almonds and green banana peel with a lovely citrus note. The palate is round and buttery from the Arbequina with flavors of apples, almonds, artichoke and black pepper that carry through the deliciously smooth finish. In terms of the fruit-to-bitterness ratio, 2016 is the most balanced oil we’ve made. Moderate to cool weather prevailed throughout the 2016 growing season, setting the stage for an average-sized olive crop. After a rainy winter, our 18 acres of olive trees flowered in April during cool weather, leading to less fruit forming on the trees in an already expected light year following the record-breaking bumper crop of 2015. Summer days were warm and moderate until an unseasonably cool August, which was followed by more sunshine in September and October, allowing each olive variety to reach optimum ripeness without the threat of rain or frost. Heavy rain arrived in late October, delaying the start of California olive oil harvest by a week with no effect on flavor. Now 20 years old, these mature trees are producing riper and more flavorful olives than ever before, regardless of weather conditions. Once optimal ripeness was achieved, olives were either handpicked in the Italian brucatura tradition or shaken into special nets. Each variety of olive was kept separate from harvesting through processing to allow all four pure olive oils to fully express themselves before any blending decisions occurred. Respecting certified extra virgin olive oil standards, the olives were milled within 24 hours of harvest, and the oil was never filtered or heated during the milling process. A master blending session was conducted during winter before the best lots of single-varietal oils were combined, resulting in a silky-smooth combination of 32% Frantoio, 28% Leccino, 20% Arbequina and 20% Pendolino. After resting in our cellars for four months, the 2016 vintage was bottled by our winemaking staff. The smooth flavor of Jordan Estate Extra Virgin Olive Oil will enhance an endless array of appetizers, salads and entrées. Use this elegant, pure olive oil as a base for salad dressings, brush it on pizzas, fresh figs wrapped in prosciutto or drizzle over grilled fish with a squeeze of citrus.